We treasure these fragrant autumn roses, still opening in our garden. Our ‘Indian Summer’ has begun its inevitable shift towards winter. The trees here grow more vibrant with each passing day; scarlet, orange, gold and clear yellow leaves dance in the wind and ornament our windshields and drive. Finally, autumn. We’re engaged in the long, slow minuet of change, sped along by storms and cold fronts sweeping across us from elsewhere. It hit 80 here yesterday as I worked in our garden. I planted the last of our stash of spring bulbs, and moved an Hydrangea shrub from its pot into good garden soil. The sun shone brightly as butterflies danced among the Pineapple Sage and flower laden Lantana in the upper garden. We had a good, soaking rain over night, waking up to winds from the north and temperatures a good 25 degrees lower than yesterday’s high. From here on, our nights will dip back into the 40’s again, and I worry about our tender plants. When to bring them in? 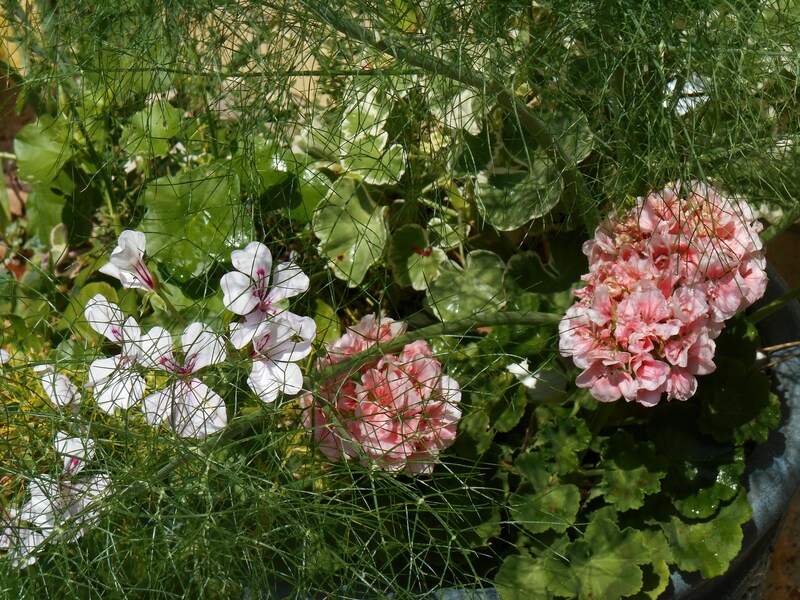 Last year I carried pots in, and then back out of the garage, for weeks as the temperatures danced up and down. This year, I”m trying to have a bit more faith and patience, leaving those precious Begonias and ferns in place as long as possible. Most of our Caladiums are inside now, but not all. I’ve left a few out in pots, and am amazed to see new leaves still opening. Warm sunshine and fresh breezes day after day seem a reward well worth the slight risk of a sudden freeze. This is how ‘climate change’ looks in our garden. We were well into December before our first freeze last year. It was balmy on Christmas, way too warm to wear holiday sweaters. One felt more like having a Margarita than hot cocoa. But why complain when the roads are clear and the heat’s not running? And I expect more of the same in the weeks ahead. Our great ‘pot’ migration from garden to house is delayed a few weeks, with the Begonias and Bougainvillea blooming their hearts out in the garden, still. The autumn Iris keep throwing up new flower stalks, the Lantana have grown to epic proportions, and the Basil and Rosemary remain covered in flowers. But the garden, flower filled as it may be, grows through a growing blanket of fallen leaves. Heavy dew bejewels each petal and leaf at dawn. Squirrels gather and chase and chatter as they prepare their nests for the cold coming. 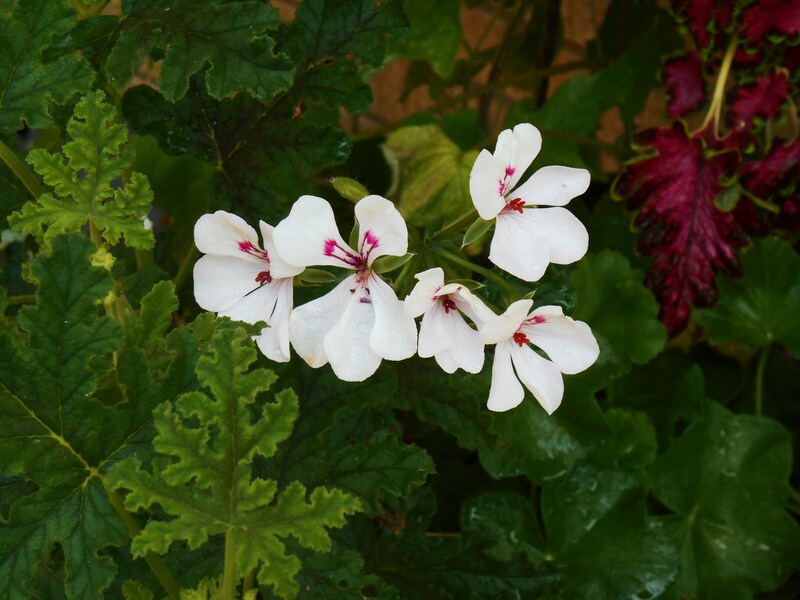 Their flowers concentrate the last bits of color and fragrance into every precious petal. They’ve grown sweeter and darker as the nights grow more chilled. We find ourselves at the Summer Solstice again; the high point of our solar year. It is the official astronomical beginning of summer in the Northern Hemisphere. But for most of us, the transitions from one season to the next are somewhat blurred. 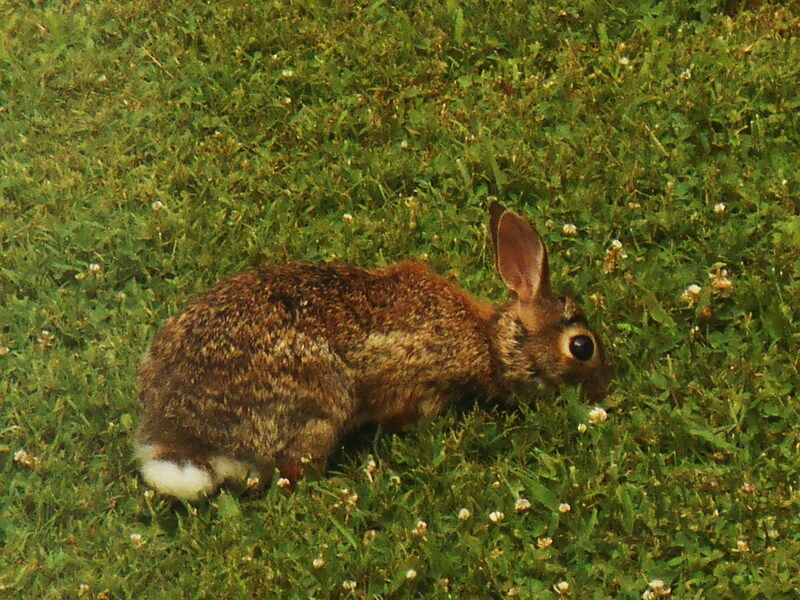 This rabbit is a frequent guest in our garden, relaxing on our lawn like a pet. I’ve only found him eating grass and clover. We listened to a discussion on our local news last night about when summer, and summer heat, actually begins. The conversation came in the context of our brutally high temperatures this week, coming days before the “official” start of summer at the Solstice on June 21. What signals “summer” to you? 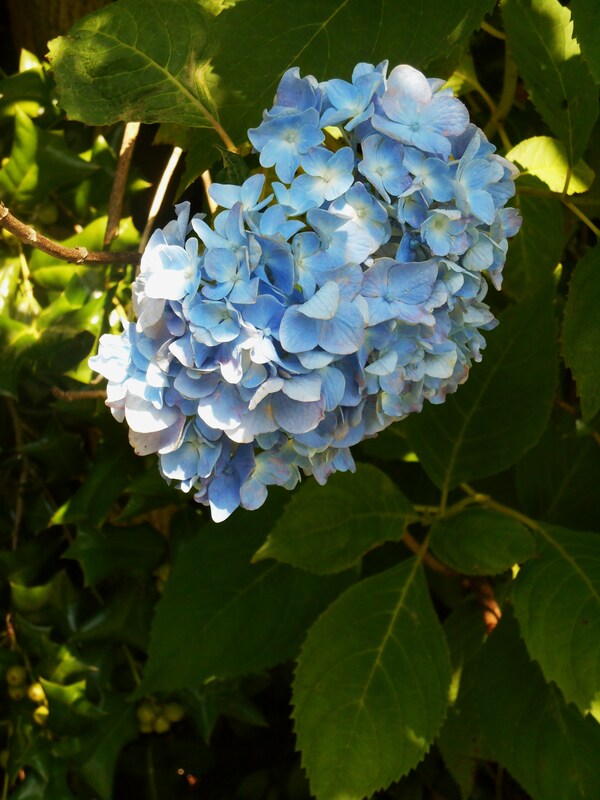 Hydrangea Macrophylla always speaks of summer to me. It has been a favorite since I was a small child. Is it the onset of uncomfortable heat? The end of the public school year? Memorial Day weekend? Graduation? Traditionally, the Summer Solstice falls on the longest day of the year. That is, the longest period of time between sunrise and sunset. 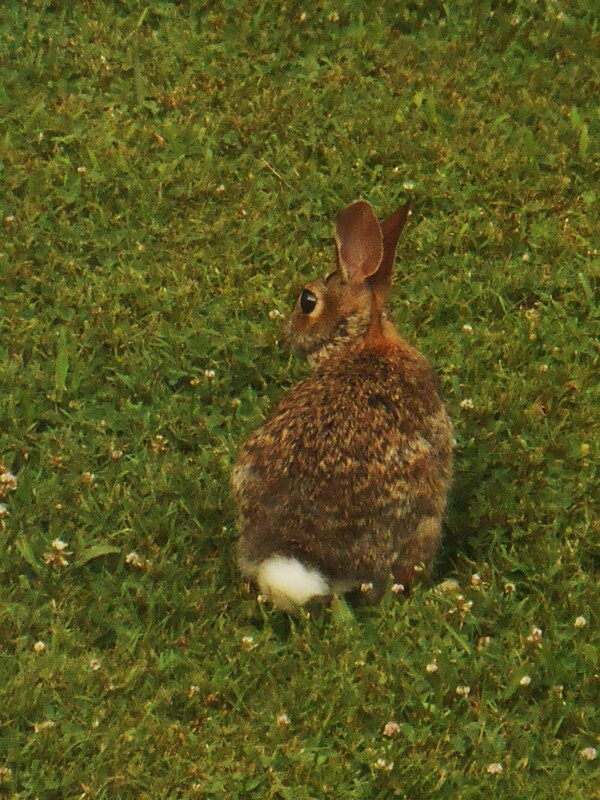 It was almost 9 PM when I took these photos of our rabbit on Wednesday evening. A long day, indeed. Although day length varies with latitude and altitude, most of us still count on our “longest day” falling around June 21 (or December 21) each year. And, it stands to reason that when our hemisphere of the planet is tilted towards the sun on our annual circuit through space, we experience our warmest weather. But our planet is in transition. Our seasons, like our weather, are shifting. 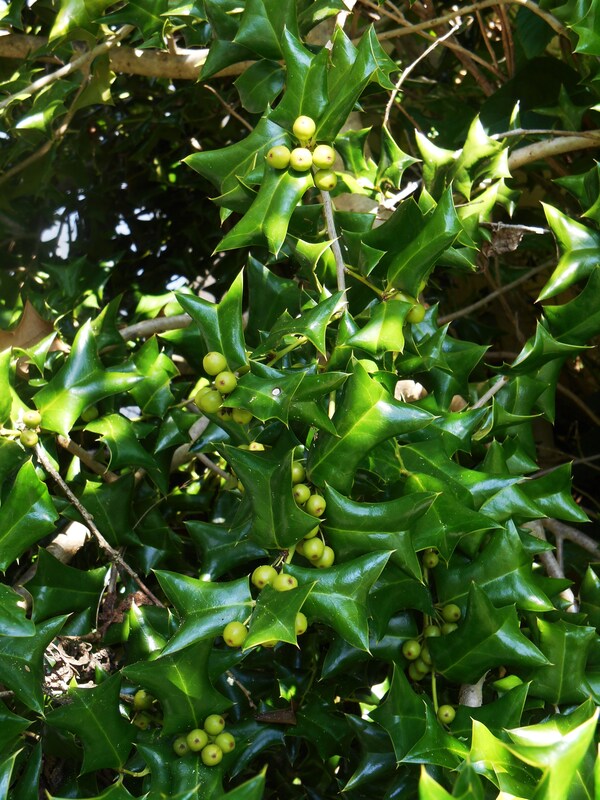 Abundant holly berries speak to a possibly intense winter ahead. This holly shrub has never produced a crop of berries like this since we’ve been in the garden. Partly due to strong earthquakes which have shifted the angle of our planet’s axis, and partly due to the ongoing movement of our magnetic poles; our climate is not what it was even ten years ago. I’ve noticed that the “astronomical” equinoxes and solstices have been shifting these last few years, too. Generally they occur earlier than their official dates. 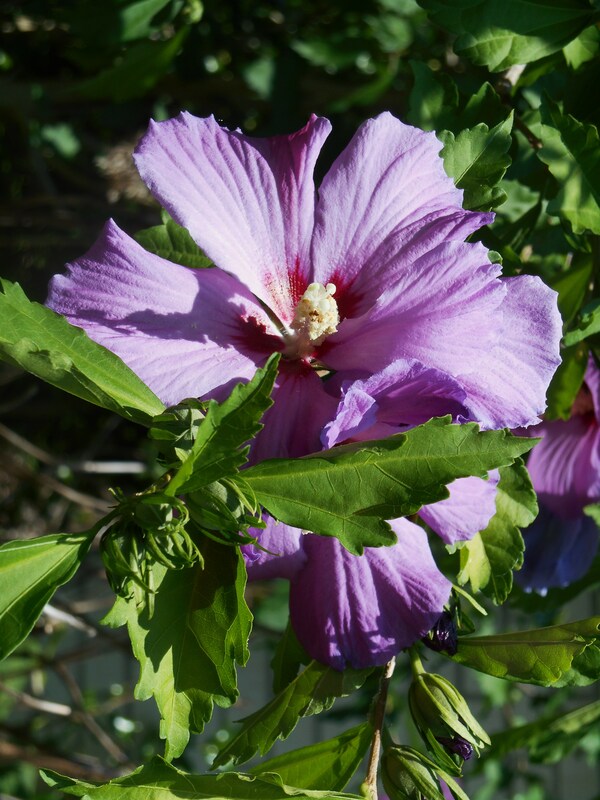 Our Rose of Sharon shrubs have burst into blossom this week, a sure sign of summer. On June 1, 2014, our sun rose at 5:48 AM and set at 8:21 PM. Our sunrise reached its earliest time on June 7 at 5:46 AM, and sunrise will stay at that hour until Saturday, June 21, when it will rise at 5:47 AM. So our time of sunrise doesn’t change at all for 14 days from June 7 through June 20. 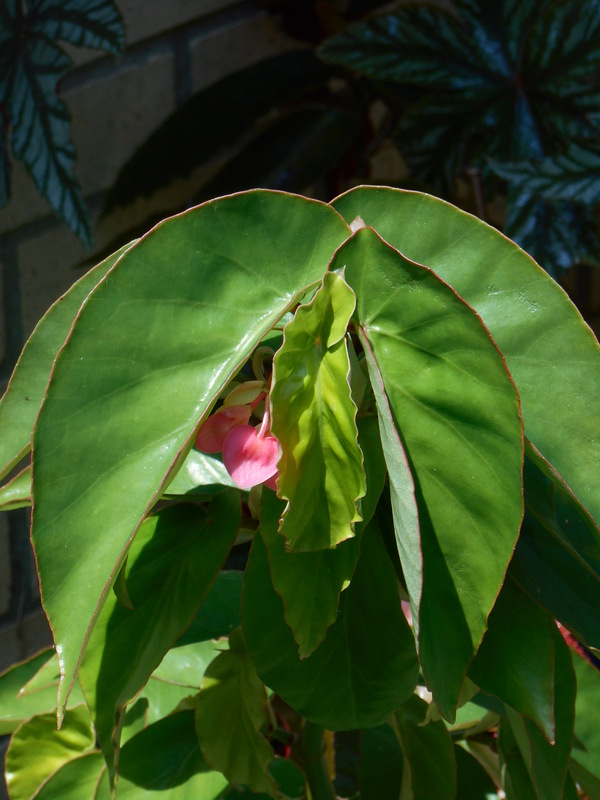 This is Begonia, “Flamingo” coming into its first flush of blooms this summer. On June 1, our sun set at 8:21 PM. Sunset came a minute later about every two days until June 18, when sunset came at 8:30 PM. Now, here is what is strange. June 18, Wednesday, was 14 hours and 44 minutes long. But so is today, and tomorrow. June 18-June 20 are exactly the same length with the same hours of sunrise and sunset in Williamsburg Virgina. So, we have a three day summer solstice this year, and we are experiencing measured temperatures in the high 90s, with heat indexes over 100 nearly every day this week. 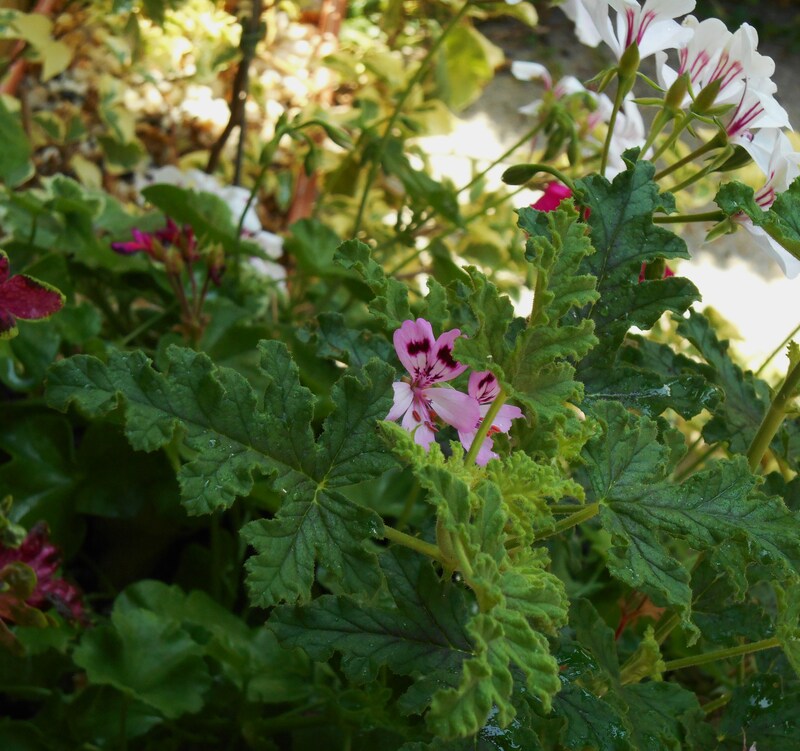 This is our rose scented geranium finally in bloom. In Norfolk yesterday, the Berkley Bridge wouldn’t close properly due to the heat, and traffic backed up for over an hour. We had warnings on our local news of “heat health emergencies” all over the area. On Saturday, our day will be a single minute shorter as sunrise moves to 5:47 AM, but sunset remains at 8:30 PM. But on Sunday, sunset comes at 8:31, so we are right back to a 14 hour and 44 minute day- the same length of daylight we are experiencing now at the Summer Solstice. Sunrise will come at 5:47 AM on June 21 through June 24. And, sunset remains at 8:31 PM through July 6. There is no change in the time of astronomical sunset for a total of 15 days. Please check your own tables for sunrise and sunset, and see what is happening in your neighborhood. Here, we will have three more days of “longest day of the year” on June 22, 23, and 24. Sunrise and sunset will both be one minute later than June 18, 19, and 20; but the total number of minutes of daylight will be exactly the same. Our time of sunrise returns to a more normal pattern around the first of July, where we will finally have sunrise time stay the same for two days at a time, then shift to a minute later on the following day. 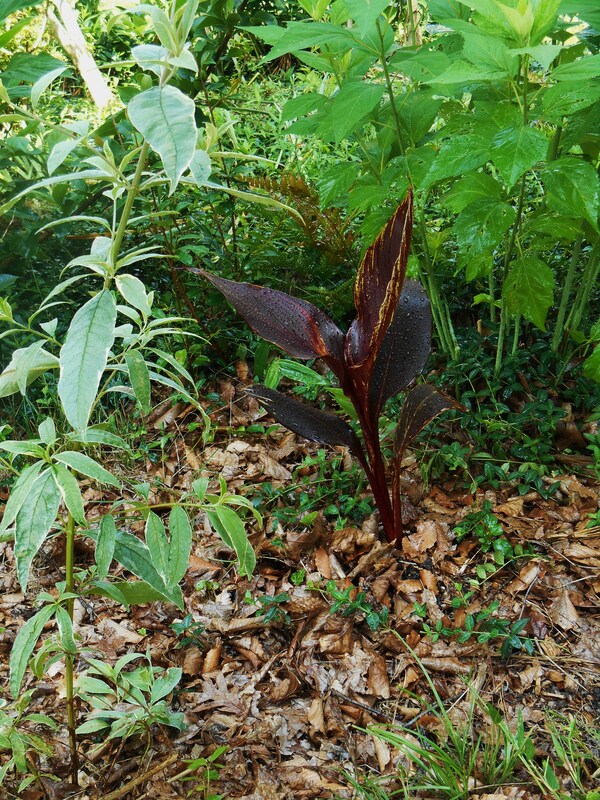 Our Canna, “Australia” came as a bare root tuber this spring. 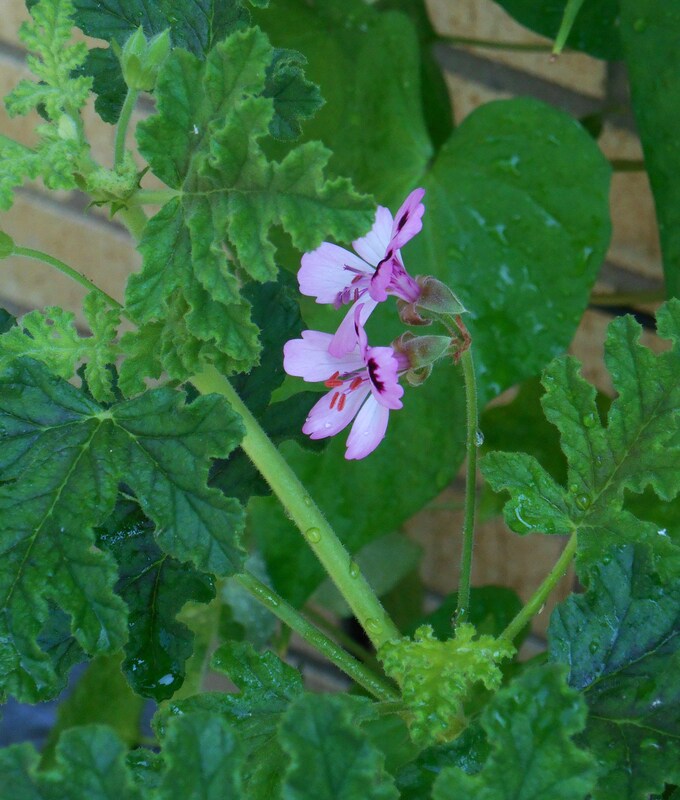 I hope it will bloom by the first of July. Hibiscus in the background is showing buds, as is the Butterfly bush to the left. So, the year turns yet again. After June 24 our days will continue to grow shorter by a minute or two each day until the Fall Equinox, in September. Summer weather generally lasts well into October in our part of Virginia, long past the start of school, the “first day of fall” and the Labor Day holiday, which is the official close of summer in the United States. Perhaps because I’m outside in the garden nearly every day, I’m keenly aware of the weather, and the rhythms of our Earth. In this time of transition, please stay in touch with what is happening in your part of the planet, also. These larger rhthms affect us all in so many ways, large and small. 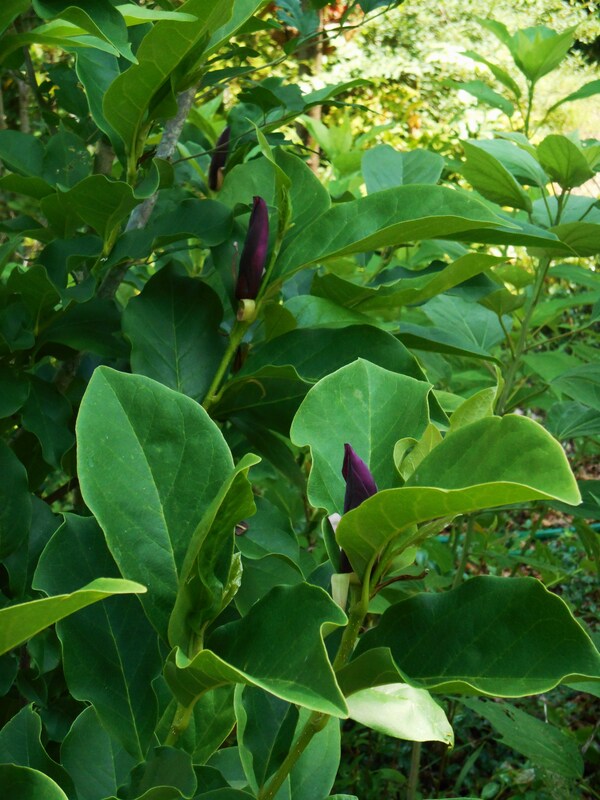 Asian Magnolia generally blooms in early spring, before the leaves come out. This shrub is ready to bloom a second time. The photo was taken this morning.